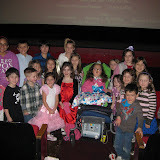 I mentioned in my last post that Ally was having a be-lated, MOVIE Birthday Party with friends from pre-school and our neighborhood friends. Her FIFTH birthday was February 2nd, but I wasn’t going to do anything till the spring/summer, since I postponed her fundraiser party. A week ago I decided that we should do something NOW, as Ally really deserves a party in celebration of this HUGE milestone! The MOVIE party was held at the Pickwick Theatre in Park Ridge, IL and we saw “Gnomeo and Juliet.” About 30 kiddos were able to join us and many parents stayed too. I never imagined such a HUGE turnout, but was pleasantly surprised. The owner and workers at the Pickwick were amazing and I highly recommend it to others. We got a special price for the movie, a popcorn and pop. We arrived 30 minutes early and stayed a little after in the theatre to take pics and sing Happy Birthday. I cannot explain in words how EXTRAORDINARY it was for Ally to have a party with sooooooo many friends who care about her. She was sooooooo happy too and loved her presents and being with friends! I chose a movie party since Ally loves movies and can enjoy them the same as typical kids. It was also easy to keep the kids occupied and entertained. My emotions have been all over the last month with the happiness of Ally turning FIVE, but also a little sadness of what she is unable to do physically at 5 and how her life is different from other 5 year olds. There is also some fear of how many more birthdays she will get to celebrate. I try to be as positive as possible while dealing with SMA, but I have to admit I have some down times once in awhile. HOWEVER, the joy and pride of all of Ally’s accomplishments outweigh all the mixed emotions. 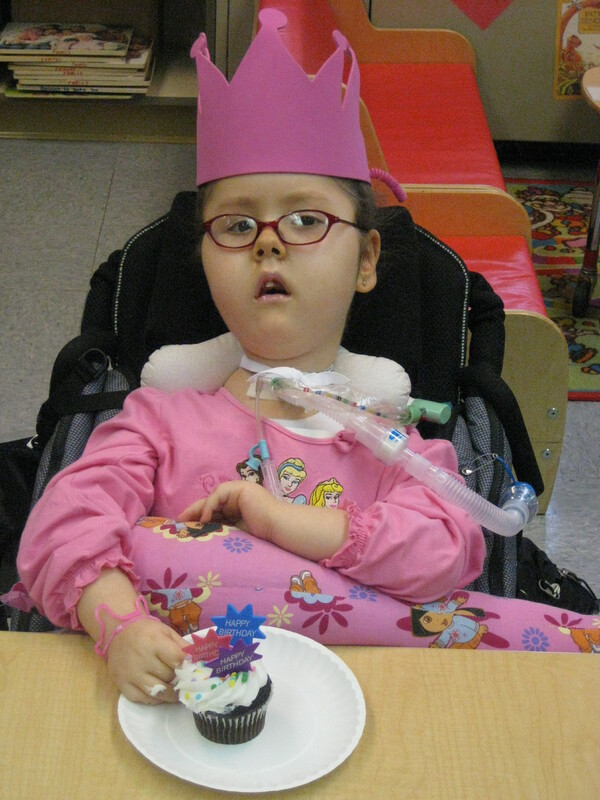 Ally is 5 and she is a VERY special girl who is LOVED by MANY!!!! She is my angel on earth teaching others about the true meaning of life, love, friendship, faith, and so much more. I must also say, the kid friends she has are MIGHTY special too — they are soooo accepting and caring towards Ally and I’m sure will be amazing grown-ups one day. A special thanks to their parents and also their teachers. 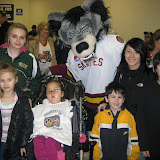 Also wanted to share the album of our family outing to the Wolves Game. We got FREE tickets from the shopping mall and called ahead so the kids could meet Skates, the mascot. Be sure to see the very special message they displayed. We paid $9.95 for the younger kiddos to join Skates Kid Club and they got some really neat t-shirts, banners, autographed pictures… They will probably attend a special Wolves Party on Monday for kids in this club too. Hope you enjoyed all the pics! This winter has been pretty good. Although Chicago had tons and tons of snow, our family and Ally have stayed overall healthy and still pretty active (knock hard on wood). Ally is going on 8 months of being out of the hospital. This is absolutely amazing and we are soooooo grateful that she has her trach. We are able to clear her lungs well every day during her breathing treatments and she is well ventilated all the time. Ally has had some small colds and even a big stomach bug, but we have been able to care for her at home without her usual lung collapses or pneumonia. We are also grateful that we have AMAZING nurses Monday-Friday daytime shifts and some evenings to help keep Ally healthy too. Thank you Maribel, Lucy and Megan — YOU ARE THE BEST!!!! Some other good news I want to share is that Ally continues to go to Preschool at Stock almost everyday. She missed some days due to snow, freezing temps, and very small illnesses, but it’s INCREDIBLE that she has been able to go at all this winter. Preschool is a breeding ground for germs, but with Ally’s trach and wonderful nurses, we have been able to keep her healthy and active. 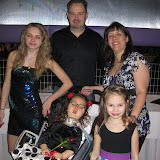 SMA children are suppose to get weaker as they get older, but Ally has become stronger and more stable over the years. Ally even goes alone (with her nurses who have been working with her 1-3 years) on a personal bus to school. She is also in a blended classroom of typical and special needs kids. Ally has a 1-on-1 nurse and 1-on-1 aide in school. She gets sooooo much out of school emotionally and academically. A HUGE thank you goes out to the staff and principal at Stock for all their hard work with Ally!!!! Things aren’t always so easy, but we are lucky to have such a strong team working with Ally. I’m beginning to look at schools for K-8th, but its so scary to think about starting over with all of the planning, advocating and educating staff about Ally and her unique needs and special qualities. More good news, our family will be attending Camp at Center for Courageous Kids (CCK) April 1st-3rd. This is the amazing camp in Kentucky we attended last year where Ally rode a horse, went swimming, went bowling and soooooo much more. At CCK there are tons of activities for the whole family and we attend during SMA Family weekend, so we are also able to connect with others who live a similar life. This is where I can use some help from family and friends. We would LOVE to make a very nice monetary donation to CCK when we attend and also donate items from their wishlist of camp needs (art and craft supplies, camp items, medical items…) in honor of Ally. Would you please consider making a contribution or donating items in honor of Ally? Checks are payable to Center for Courageous Kids and I can pick up items you wish to donate by March 31st. You can see a list by clicking on the PLEASE HELP tab at the top of Ally’s webpage or click here https://angelally.wordpress.com/help-please-collect-donate-to-cck/. Our address is Krajewski – 3614 N. New England, Chicago, IL 60634 if you would like to donate in Ally’s honor. Have you seen the special MDA Shamrocks being sold at Burger King, Culvers, Lowes, Jiffy Lube, some Walgreens and many, many other places? 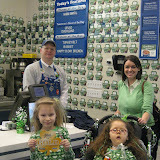 Every March MDA Shamrocks are sold to help children and adults with SMA and 42 other diseases/dystrophies. Ally is a Shambassador and we are visiting places to thank them for selling shamrocks and raising awareness as we work towards a cure and treatment of SMA and other diseases. These places and those making donations offer us hope too. Please consider donating $1 or $5 when you see a shamrock being sold and mention Ally to the staff, so they know they are making a difference. Here’s an album of Ally as a Shambassador this year and last year…. PS – We love messages and emails from friends and family!